Saira Elian grew up moving every two years and so she has learned to be independent. At this point, Saira is pretty sure that she can handle anything that life throws at her but she didn't count on falling through a graffiti tag and ending up back in Victorian times. 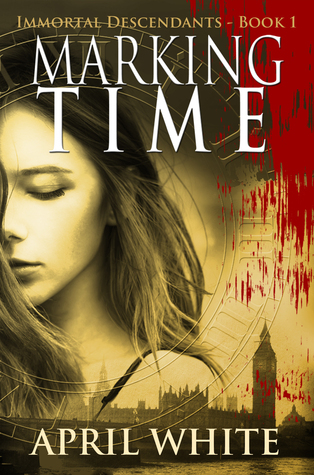 The 17 year old Saira suddenly finds herself gearing up to battle Jack the Ripper and learning that the world is so much more complicated than she ever thought it was. Being a descendant of immortals and in her case, a descendant of Time and apparently the one fated to bring the families together, means that Saira is going to have to race against time if she is going to save her mother. Thankfully, for the first time in her life, Saira has friends that she can count on and a vampire who has loved her for well over 100 years. I have never been a fan of YA, so I had my doubts when I picked up Marking Time but I'm happy to report that I quickly fell into the story and cannot wait to find out what journey White takes her characters on. I will admit to having my doubts about Saira at first but as White reminded us how stark and independent her childhood was, it makes sense that she would chafe under the suddenly imposed rules of a relative that she had never met, and being forced out of her comfort zone to embrace things like dressing for dinner and attending an exclusive boarding school. There is a strain of romance running through this story. When Saira first meets Archer, she has no idea who he is and how much he will come to mean to her. It would be a mistake going into this believing that it is a paranormal romance because while the love story is important to the entire narrative, it isn't the point to the story. I have to admit to not being a fan of teenage girls being paired with vampires hundreds of years older than them but this is mitigated somewhat by the fact that when Saira develops a relationship with Archer in the past, he is human and actually not much older than her. It's one of the few iterations of vampire/teenage girl that doesn't feel completely predatory. I'm absolutely fascinated with the world that White built. There are shifters, vampires, werewolves, time travelers and people who can see the future. I really cannot wait to learn more about the immortals who created these unique descendants. Because the world is so rich, there are so many directions that White can take the story, particularly if she chooses to focus on the war between the descendants themselves, or take the story into the future. I know I've gushed just a little bit but there are a few problems with Making Time. The first book in every series sets up the universe and establishes the rules for what the characters can and cannot do but I do believe that White got bogged down with the details when she started discussing DNA and creating a scientific explanation for how and why the descendants are the way that they are. It was the only time I found myself skipping the page and I really felt that it added nothing to the story to speak of. Being in Victorian England meant that Saira found herself in a world in which men and women were forced into rigid gender roles. I love that she didn't instantly comply with what was expected and stayed true to who she is - a modern woman. Every time that Ringo and Archer worried for her reputation, she was quick to push it aside. I further love that Saira dressed in a masculine fashion in order to have the freedom that she required to what she needed to do. White made it clear that the choice to pass as male is something that many an enterprising young woman chose to do in order to free themselves from strict moral and gender codes. Marking Time easily passed the Bechdel test and it was good to see Saira form relationships with men and women equally, even if the routine at the schools sometimes weighed down the story. White used Ringo to do a small interrogation of class. Far too often when we have time travel books, they focus on the upper class but in this case, White decided to look at the precarious lives of the poor in Victorian England. Ringo actually had to sneak into his home each nigh because it wasn't a legal lodging and he could only have a fire to stave off the cold at certain times. Ringo also couldn't read and so Saira and Archer had to teach him. Even Archer, who did have some class privileges was forced into the seminary simply because he's the second son. Unfortunately, Marking Time is another book that falls into the category of magically diverse humanly erased. White had shifters, vampires, time travelers, psychics and werewolves but really didn't have many marginalised people to speak of. There were no LGBT characters in the story which makes absolutely no sense and must be called out for the erasure that it is. White did include one person of colour side character but the character is so insignificant that I'm hard pressed to even remember the name as I am writing this review. It will never cease to amaze me that writers can take the time to create such supernatural diversity, yet somehow fill their stories with White, cis, het, people. I'm absolutely going to continue on with this series. White crafted a fascinating world with characters that are clearly developing. Saira grew throughout the novel from someone who was very standoffish in the beginning, to someone who learned to trust over time. I like that Saira was new to the world which meant that we (the reader) were learning at the same time that she was. I love that Saira was into parkour and never hesitated to take anyone on, regardless of who they were or what their skill set was. She's a scrappy protagonist who doesn't easily submit but smart enough to know when she needs to listen and to be open about what she might need to learn. Marking Time, for me, is all about potential, so I can only hope that White lives up to the expectations that she set up in this first book as this series goes on. Grab a glass of wine folks and start reading, this book is absolutely worth your time.